Doctors suspect the 51-year-old athlete succumbed to an unusual, but severe form of an infection called Weil's disease or leptospirosis. 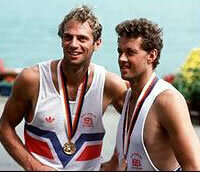 Holmes was part of the coxed four crew, with Sir Steve Redgrave, which won a gold medal at the 1984 Olympics in Los Angeles. Four years later he paired with Sir Redgrave in the coxless pairs at the Olympics in Seoul. As his obituary in The Guardian shows, Andy was passionate about sport including playing rugby with actor Hugh Grant while they were both pupils at Hammersmith's Latymer Upper School. His interest in rowing on the nearby river Thames began at the school where he was coached by Jim Clark, (winner of an Olympic Silver in the 1976 Montreal Olympics). It's likely that Holmes, who had been involved in coaching over the past two years after returning to the sport, caught the disease from contact with dirty river water. Holmes recently coached at Barn Elms Boat Club before became director of rowing at both Furnivall Sculling Club, in Hammersmith, west London and the new Langley Academy, which trains on the 2012 Olympic lake at Dorney, near Eton became director of rowing at both Furnivall Sculling Club, in Hammersmith, west London and the new Langley Academy, which trains on the 2012 Olympic lake at Dorney, near Eton. Local rower Malory Fletcher told PutneySW15.com: "In our lives we all hope to meet a hero who is inspirational and motivates us far beyond our own set limitations for me that was Andy. He totally motivated and enabled me to achieve way beyond what I thought possible so much so that I felt that I could not let him down as he had so much faith in me! I have never had such an influence in my life." And fellow rower Mirren Postlethwaite said: "Andy was awesome, patient, motivating and challenging. He believed in people and enabled them to believe in themselves. Rowing on the Tideway in Putney is not easy but he taught us to cope well in all conditions. We still have more to learn we will miss him." He leaves his wife, Gabrielle, and four daughters and a son. Weil's disease is found all over the world, including in the UK, but generally is more of a problem in hot places, like the tropics. Animals, like rats and cattle, carry the bacterium and it can spread it to humans who come into close contact. Rowers amongst most water sports enthusiasts are more susceptible to catching it because the infection can be carried in water contaminated with animal urine. The bacterium responsible can enter the body via cuts and abrasions of the skin, or through the thin lining of the throat, nose, mouth or eyes. British Rowing advise precautions, like covering cuts, scratches or sores with a waterproof plaster and showering after going out on the river, can minimise risk. Steve Redgrave, told BBC Radio 5 live: ".....it is very rare that anything happens because normally rivers flow fast enough and dilute it." Tony Reynolds, regional safety advisor for the Thames Region Rowing Council, said it was difficult to know where Andy might have caught the infection from: "We just don't know and that is the worst thing. It can take weeks after catching the infection to develop the symptoms, which makes it harder to trace. It's important not to speculate. But it shows that anyone can be at risk and how important it is to protect yourself. Symptoms can range from none at all to a mild flu-like illness, or a more severe illness called Weil's disease, with jaundice and kidney failure. In most cases, with antibiotic treatment, the person will make a complete recovery. But for a few, it can be fatal even with the best hospital care.